For Chef’s Table this month, we partner with MOFAD Chef John Hutt and Burlap & Barrel co-founder Ethan Frisch, on a journey through the Silk Road from China to Venice, tracing how Chinese foodways evolved on the journey from Chang’an into Xinjiang, the oasis cities of Central Asia, the Middle East, and finally Europe. Where silk was the transport, food was the connection that opened up the doors of cultural translation. 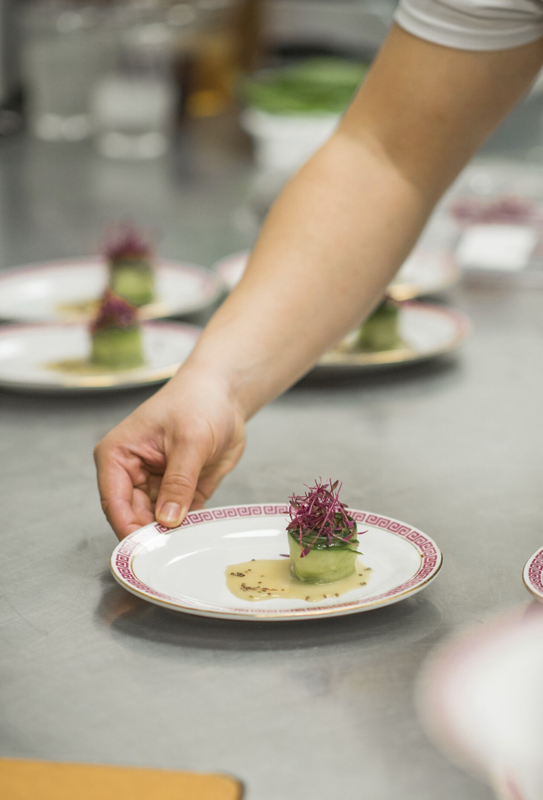 Our third course featured three types of dumplings, inspired by spices and flavors along the silk road. Want to know the next theme and make a reservation before everyone else? Sign up for our Chef's Table Mailing list. What Chef's Table theme would you love to see next? The recipes we’re cooking from this month are very, very old. 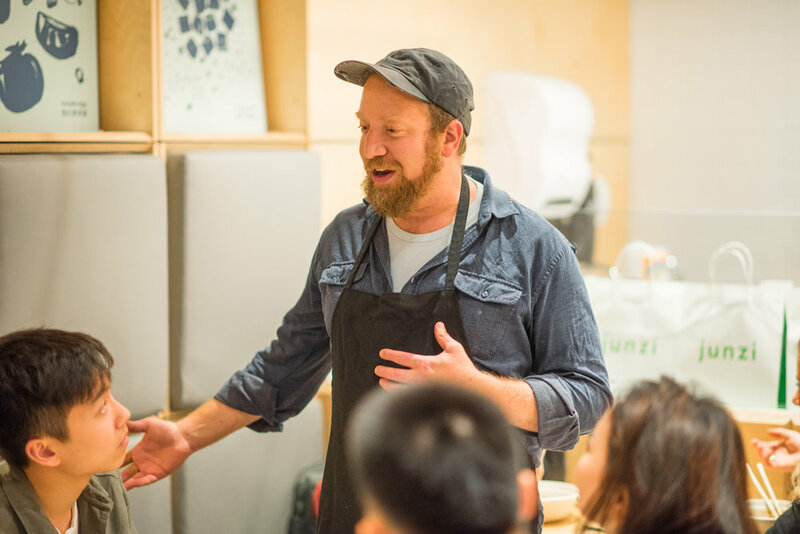 For Chef’s Table in October, we partnered with vinegar expert Michael Harlan Turkell and vinegar purveyor Gotham Grove to explore the role of vinegar in Chinese cooking and how Chinese cuisine influenced the use of vinegar in cultures beyond. 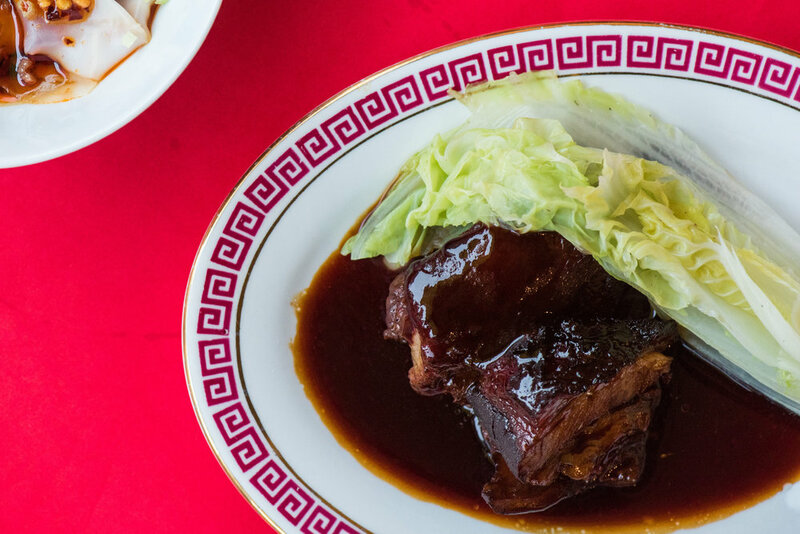 Over 6 courses, we’ll examined how a slight twist in just the component of vinegar in traditional Chinese dishes can transform and transport flavor profiles into novel directions. 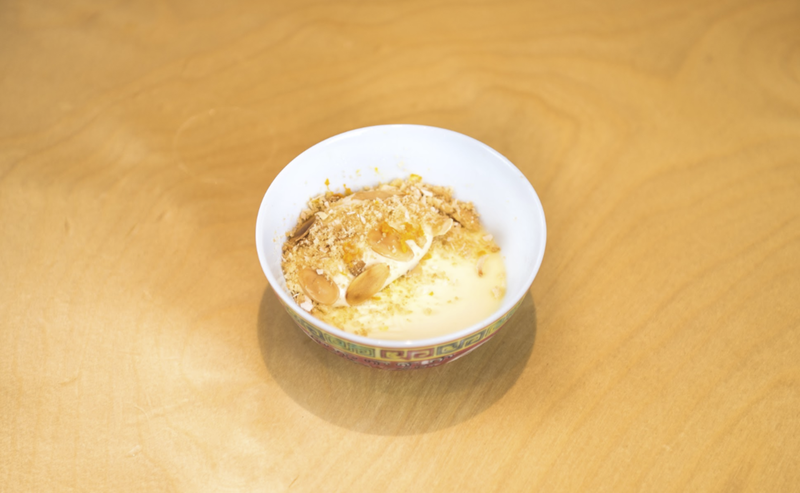 The classic pineapple custard bun (港式菠蘿包) a Hong Kong bakery staple, was our last course in this meal. In the beginning, more than 2,000 years ago, Romans built aqueducts and snacked on bread, vegetables, olives, and fish sauce. Meanwhile, Chinese courtsmen were inventing paper, cultivating fruits, eating domesticated birds and making soy sauce. The two empires sat on opposite edges of the earth, but philosophers and eunuchs alike had already begun to sing the songs of food as medicine, food as decadence, food as civilization. Since the two cultures came in contact, sometime around 97 AD, Italian and Chinese cuisines have evolved in wildly, often disparate but sometimes overlapping manners. This August, over 5-7 courses, we take a look at the lattice of those intersecting cuisines and how they complement each other, beginning with the Romans and ending in the literal intersection of Little Italy and Chinatown, here in Manhattan. What other themes would like us to make a dinner of? As a culinary encyclopaedia, this book catalogued regional recipes that eventually permeated into the national cuisine of the whole of China. Today, many of the most iconic Chinese dishes had roots in recipes from this book, which we’ve taken the liberty to serve them to you tonight. Each menu is designed and printed in-house by our creative team, inspired by the theme of the month. Family-style 2nd course: Roasted duck and fluffy poppy seed bao with lamb gravy, to soak up all that flavor. Chef Lucas describing Hu Sihui's "A Soup for the Qan" the book that inspired April's Chef's Table recipes and ingredients. For April, we got our spring flowers from Fox Fodder Farm and a porcelain soy sauce bottle-turned vase from our friends at Wing on Wo. What dinner theme would you like to see next? 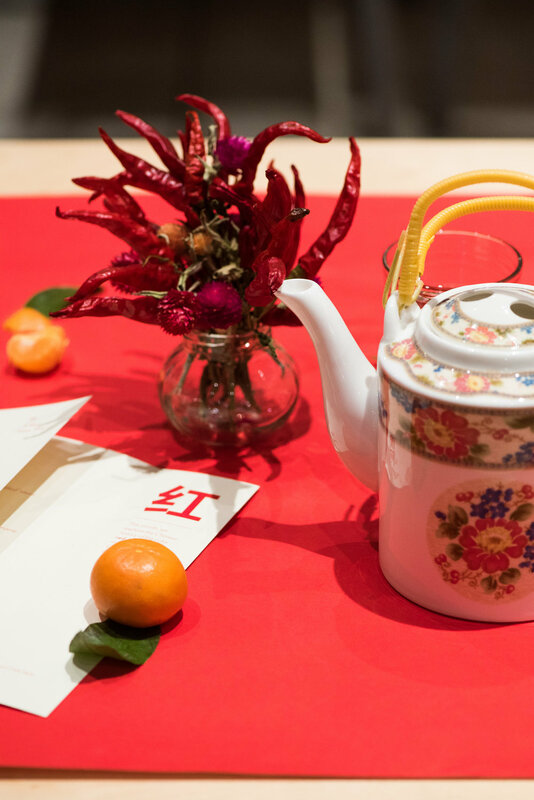 For our February Chef's Table, we explored the Chinese history of the color red, a color that is more apparent in Chinese cuisine than anywhere else. Our soy sauce is cooked down with black sugar, Chinese licorice, ginger, galangal, chilis, etc. Finally the pork and celery wontons are served with a squeeze of blood orange and chervil. Red Cooked: A common technique, likely invented in Jiangsu, but now as popular in imperial kitchens as in home kitchens. it's usually a braise of spices, soy sauce, and sugar. There's no soy sauce, the red color comes from a caramel. in the absence of soy sauce, the other spices have a bit more room to shine., producing a pork belly that's wonderfully succulent and nuanced. We hope to see you at the next Junzi Chef's Table. Get your spot before it sells out, your tastebuds will thank you. What dinner theme do you want to see next? 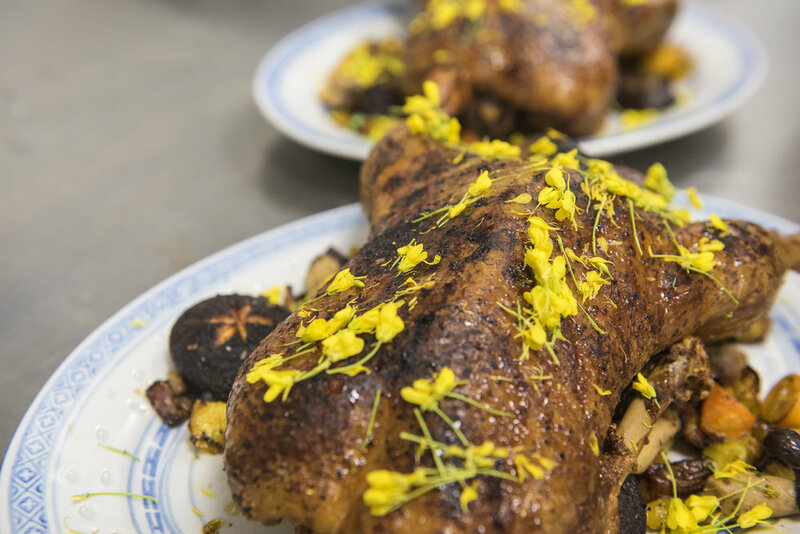 Junzi Chef's Table is a monthly dinner series that extends Junzi flavors beyond our everyday menu, and explores the narrative of Chinese cuisine as it intersects with areas of food, drink, and culture. Chef and Culinary Director Lucas Sin curates a five-course tasting menu with a different theme every month. All you need to bring is your curious appetite.